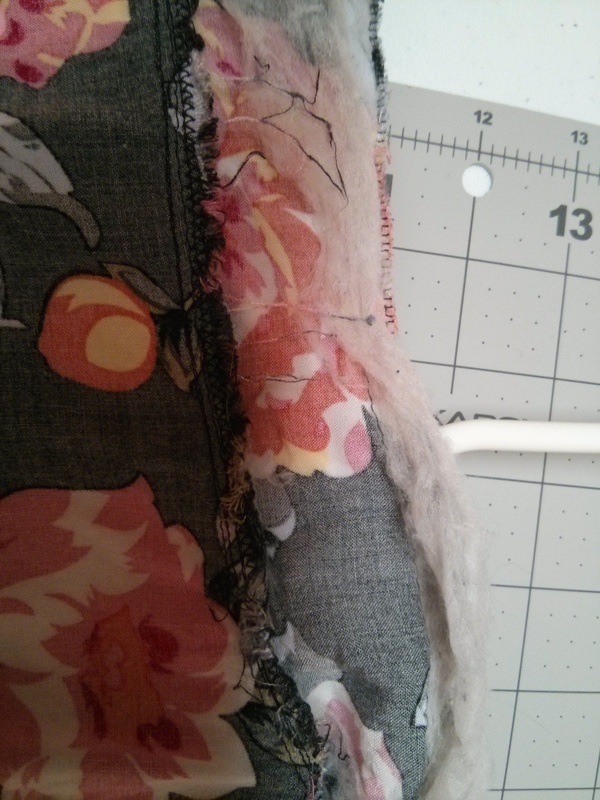 Interfacing Discussion: How does it wear (over time)? Let me say this right off the bat–I still don’t know too much about interfacing. My first experience with interfacing was walking into the Jo-Ann’s to find some for my first dress. I looked at the array and picked one at random, one that seemed light and stable for a woven dress. It was a Pellon interfacing. I asked for help at the desk, but the person said that she could not help me pick it out. (That’s a discussion for another day.) 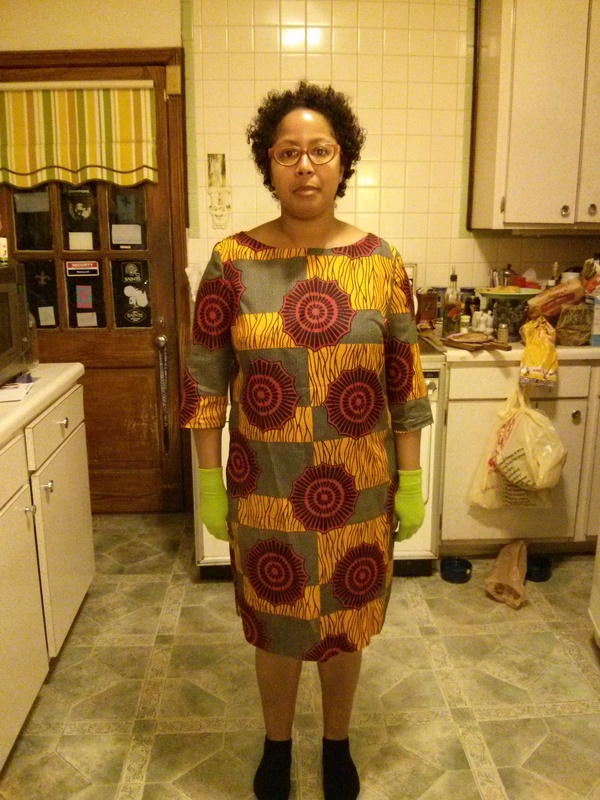 When I look at my first few garments made with Pellon interfacing, I wince. The fusible interfacing rips off of the facing in little balls and wisps, as if a cotton ball were falling apart. The sew-in interfacing is not much better. This is Pellon fusible interfacing after almost a year of washing cycles. After reading a lot of sewing blogs, I started noticing that a particular brand of interfacing was praised, while another was vilified. Everyone loves Fashion Sewing Supply’s interfacing! Everyone hates Pellon interfacing. Now, I know why. 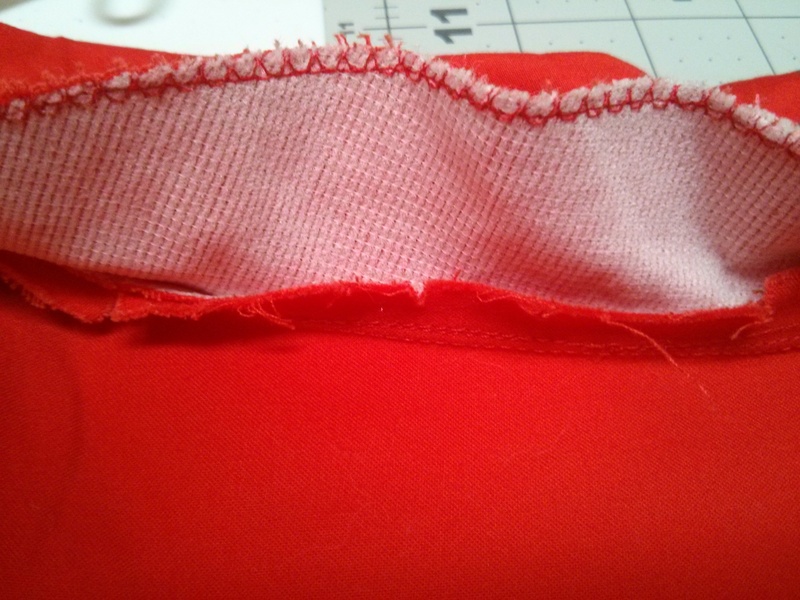 I ordered some interfacing from FSS and, to no one’s surprise, the interfacing was much better. It felt better to the touch than the Pellon, not plasticky at all. The glue was more evenly distributed on the fusible lengths; when I went to fuse, the interfacings bonded quickly and strongly to the facings with no bubbles. I’ve washed the garments I made with the FSS interfacing (and hung them to dry, as I do all of my handmade garments), and the interfacing has held up well, with very little wear. Here’s the Fashion Sewing Supply fusible interfacing in action. This dress is about 6 months old and has been washed a few times. I ordered more from FSS in a variety of weights and colors. I am looking forward to seeing how it wears. I also have used muslin as interfacing. I saw the suggestion on a few blogs; Sewaholic is the main one that comes to mind. I like how it uses up bits and bobs that otherwise wouldn’t get used, and how the muslin is a breathable, natural fabric. It also wears well, even with all the friction from washing and wearing. On the other hand, I feel like it gets a bit poofy when I use it as a sew-in interfacing. I do like it as an underlining, though, especially with a synthetic fashion fabric. I think I will continue to use muslin as interfacing, whenever the garment seems to warrant it. What kind of interfacing do you use? How did you learn about the different kinds of interfacing? 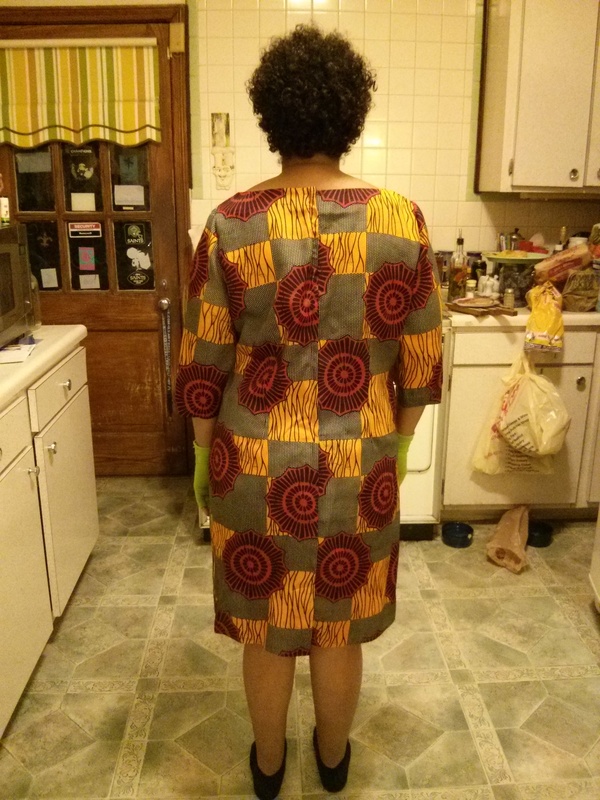 Here is the completed dress! 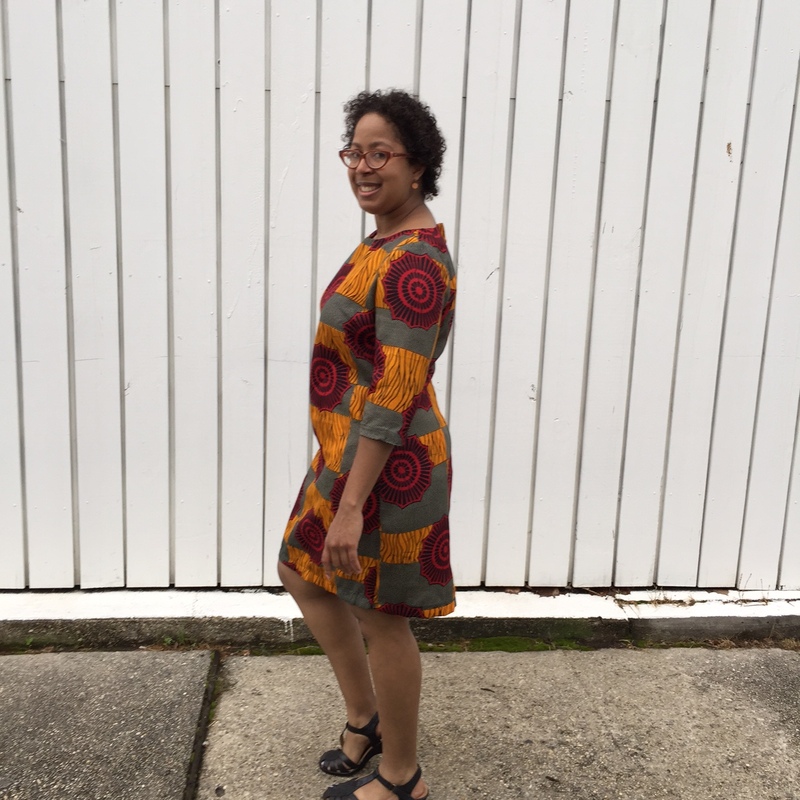 I was frustrated by the tent-ishness of the unaltered NL 6145, so I took it to Heather at Sew Fabulous and asked her to help me make it more fitted. She suggested that I draw (and sew) in a new waist curve and lengthen the back darts up to around my shoulder blades. I also made the new darts take in about an inch of fabric each. This is definitely an improvement over the original! Here are some alternate views of the dress. It’s still not perfect, but it’s better. I think the lack of drape in the fabric contributes to all of the weird lumps as I move my body in the dress. Here is the side view. The dress showcases my back curves.There are some odd folds back there, though. Here is the back view.If it were any tighter, I wouldn’t be able to sit, but it still looks loose here. Alternate side view. See how the fabric blouses in the front when I lift my knee. I think the stiffness of the fabric is contributing to that. What do you think? I think I might try to make this again, using the alterations that Heather helped me do, but in a knit so that I can be more comfortable and so that there can be more drape. I really would like to have a flattering woven shift with sleeves. Maybe I should also try this in something like a rayon challis. I will work on finishing the Vogue 9021 dress within the next week and will post it as soon as I can! New Look 6145, View B: Now with Sleeves! Plus, Fitting Issues. So roomy in the bust and waist areas! I look like a rectangle. Peep my crafting gloves! Best gift ever for a crafter. 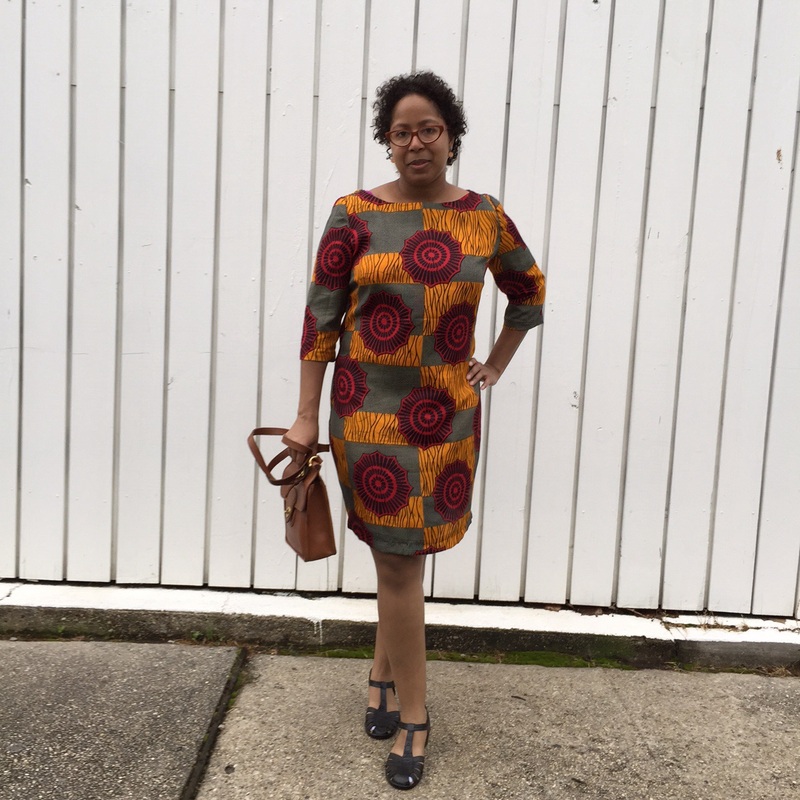 I know the African wax cloth, which is a quilting weight cotton, is to blame for the stiff drape (anti-drape) of this dress. 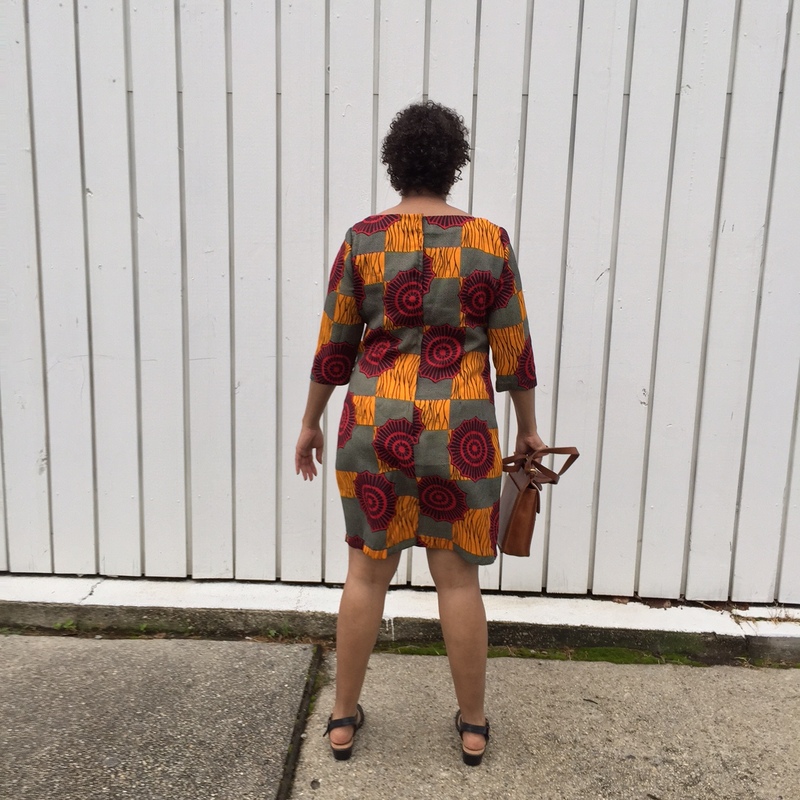 I have a curvy figure: 41″ full bust, 33″ waist, 43″ hips. I want to show it off, not hide it in a cocoon. I need to address this, possibly with taking in the sides and adjusting the intake of the darts. I will also shorten the dress. 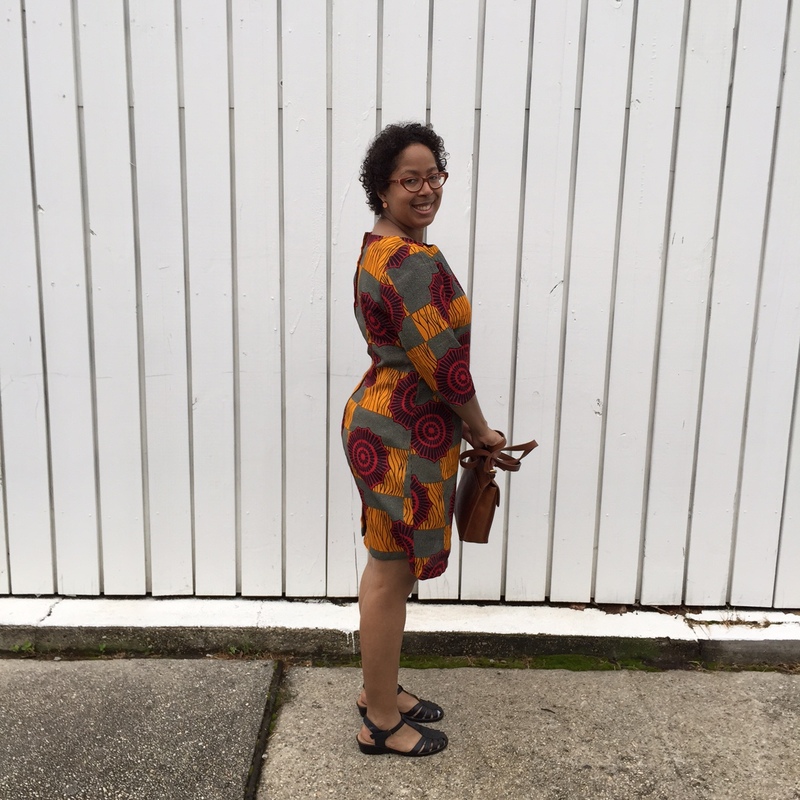 As a shorty, I look better in a just-above-knee-length dress, and I know with even with the hem, the dress as it is will come to the bottom of my knees. The sleeves look okay here, but when I raise my arm at all, the hem of the sleeve digs into my arm. There’s no give there at all. I think I will shorten the sleeves so that I have the ability to move. In my next version, I will adjust the sleeve to be a bit wider. This is okay, aside from my janky lapped zipper issues at the top. No one will notice that. This was my second lapped zipper, I believe. I want to make this again in a woven, maybe a flowy rayon challis, once I make the adjustments. I also want to try this in a knit. This seems like an appropriate dress style for work, so I want to make this thing happen! As always, I welcome your feedback and suggestions. I am going to try redoing the topstitching on Vogue 9021 after trying out different tensions and stitch lengths on a scrap of the broadcloth, and I think I will not topstitch all the way down, since that is causing the weird puckers at the bottom. Maybe I will tack that extra facing flap down, so that it stays out of the way.